“Klee could have made good storyboards, you know.” That's what Alfred Hitchcock once told his friend and biographer, Charlotte Chandler. 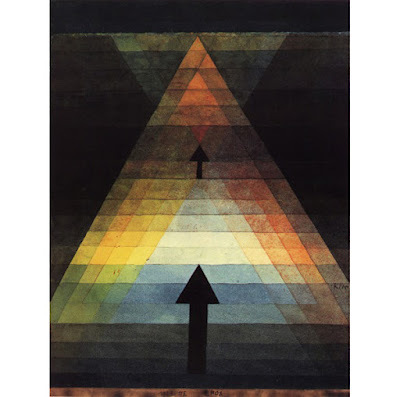 Perhaps he felt that way because Klee, like him, was motivated by the desire to create a new, transcendent visual language. Hitchcock's own art directional style (remember, before he went into the movies, he was a graphic designer in advertising) overlapped with that painter's. 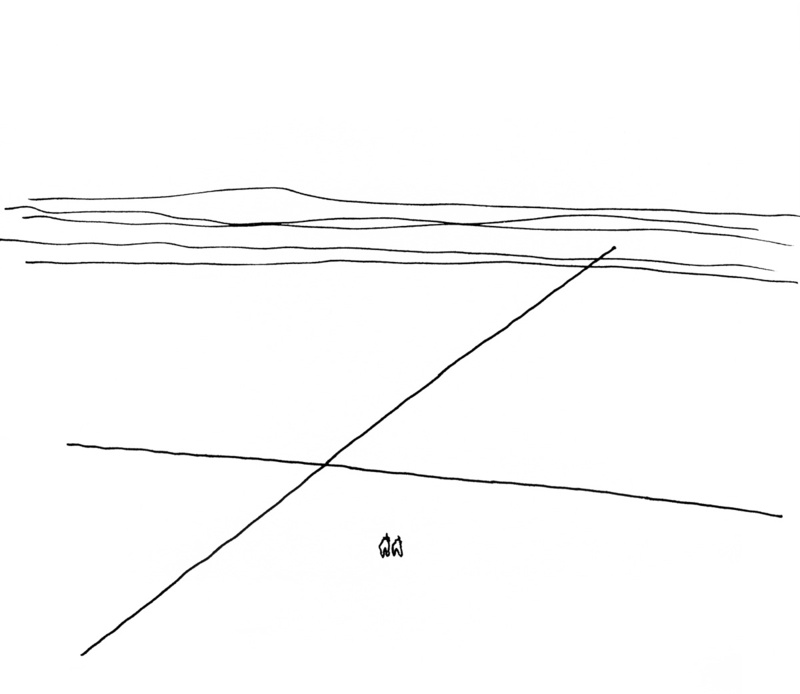 Both of them often began with one simple graphic idea and then elaborated on it, developing a fugue of associations. 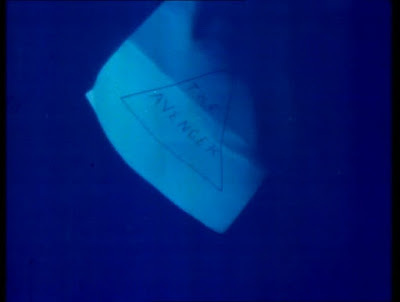 Top: The Avenger leaves his triangle "signature" on his murder victims. 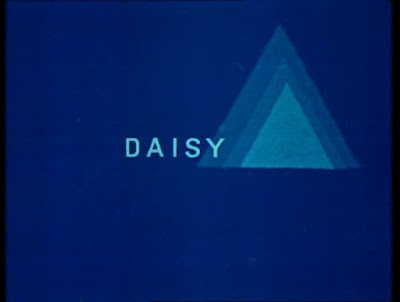 Middle: The rhythmic triangles title cards that link the character Daisy (played by "June") to the murders and the love triangle she's caught in loom larger in each successive appearance, echoing the approaching danger she's in. 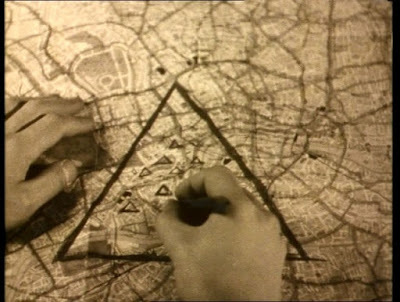 Bottom: The murders all take place within a triangular section of London and the crime scenes are also marked with triangles. E. McKnight Kauffer, a founding member of the left-leaning London Film Society, who created the title designs for The Lodger four years after Klee produced Eros, was one of the period's most sought-after graphic artists. Largely forgotten now, in his day he was known as "The Picasso of Advertising Design;" one critic enthused that he "makes one resent the division of the arts into major and minor." Whether he had Klee's painting specifically in mind is anybody's guess. The point is that such aesthetics were in the air, and Hitch made a conscious choice—against the better judgement of his meal-ticket providers (producers, distributors, etc. ), I might add—to bring these avant-garde art touches to his film. 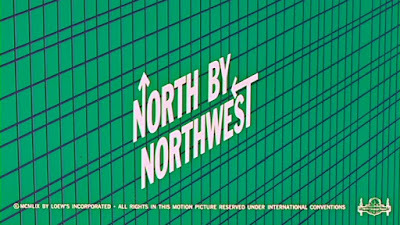 Hitch's penchant for building his films around specific graphic forms reached their height when he worked with another superstar advertising designer, Saul Bass, on Vertigo (1958), North by Northwest (1959) and Psycho (1960). 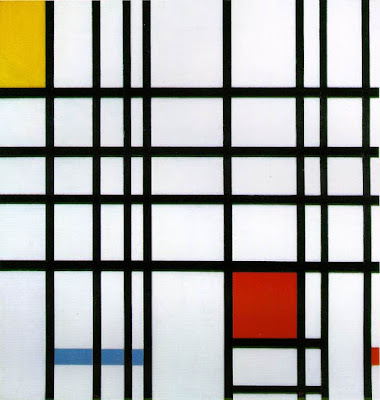 Bass, too, was heavily influenced by the Bauhaus movement and Scandinavian design, which often advocated for simple forms, clean lines and the use of mechanical devices to produce artwork. For instance, regarding the latter, in order to create the spiraling images that float about in the opening credits to Vertigo, Bass retooled WWII airplane engine parts to make an early version of a Spirograph. The opening credits of North by Northwest are often compared to Mondrian's gridlike abstractions. 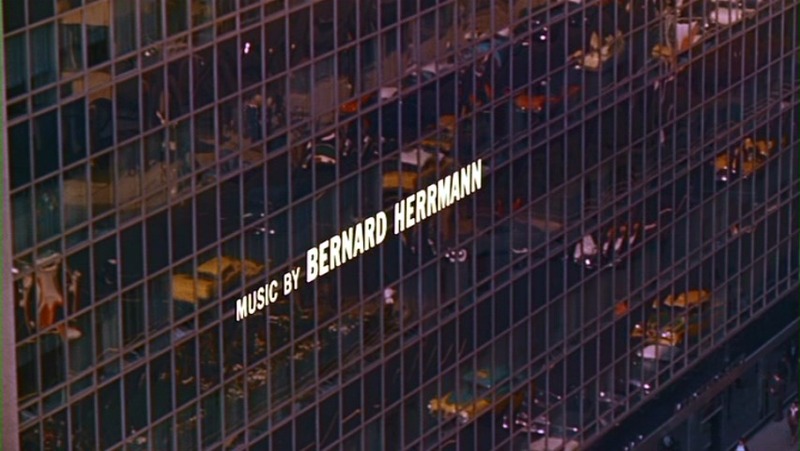 Take a look at the intro—and listen to Bernard Herrmann's syncopated orchestration that accompanies it. 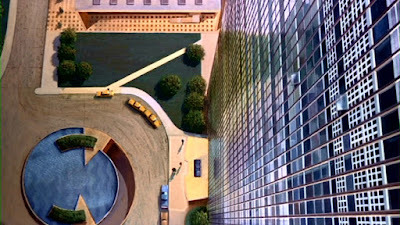 Roger Thornhill's (Cary Grant's) offices at 650 Madison Avenue reflect the traffic below, making it appear to be no more consequential than an anthill. 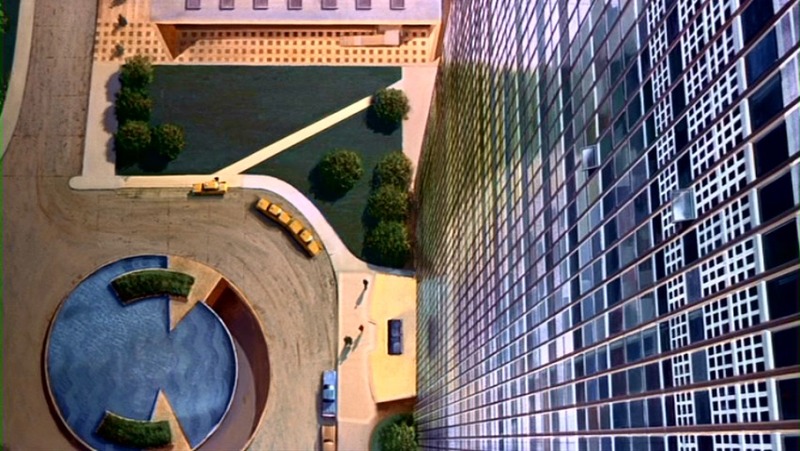 In this Kandinsky-like view of the United Nations Plaza (it's actually a matte painting), an ant-sized Thornhill makes his extremely improbable escape to one of the waiting taxis. Hitchcock geek/architecture scholar Steven Jacobs points out that the UN Building was co-designed by Oscar Niemeyer, who also was in the midst of designing Brazil's planned capital city, Brasilia, and that one of his sketches for that city layout resembles the high-angle shot of the cornfield below! If these connections keep piling up, I'm going to need to start a crazy wall. 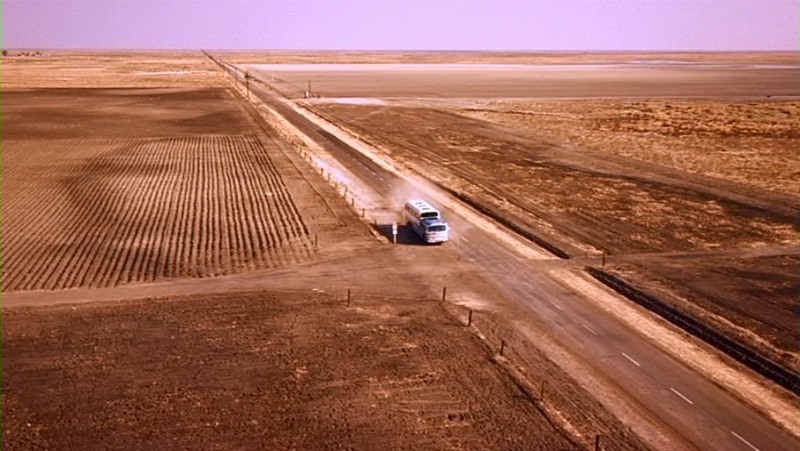 Only Hitchcock could make this frying pan-flat farmland look vertiginous. As the couple scrambles about the faces of Mt. Rushmore during the climactic conclusion of the movie, we get up-close views of its striated surface, along with the rubble that accumulated during its construction. It's like a peek behind the curtain of its creation; a corollary to the movie's story, which also reveals the inner—and cynical—workings of the U.S. government. Like Michelangelo's unfinished slaves, these lacerated rock walls appear frozen in the act of creation, as Thornhill and Eve Kendall come alive when they into contact with them. 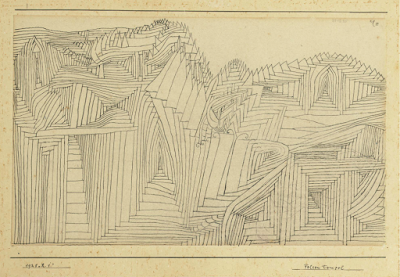 In Hitchcock and Art: Fatal Coincidences, Dominique Païni says: "Most of Hitchcock's fleeing couples must negotiate labyrinths in addition to overcoming heights, as illustrated in the the drawing entitled Rock[-Cut] Temple by Paul Klee—the same artist who had created a very 'architecturalized' and unusually 'metaphysical' painting that was part of Hitchcock's collection. [He's probably referring to Strange Hunt.] This drawing [Rock-Cut Temple] is strangely reminiscent of the legendary Mt. Rushmore, with its monumental presidential faces." I have to agree that this compares evocatively to the Mt. Rushmore scene. 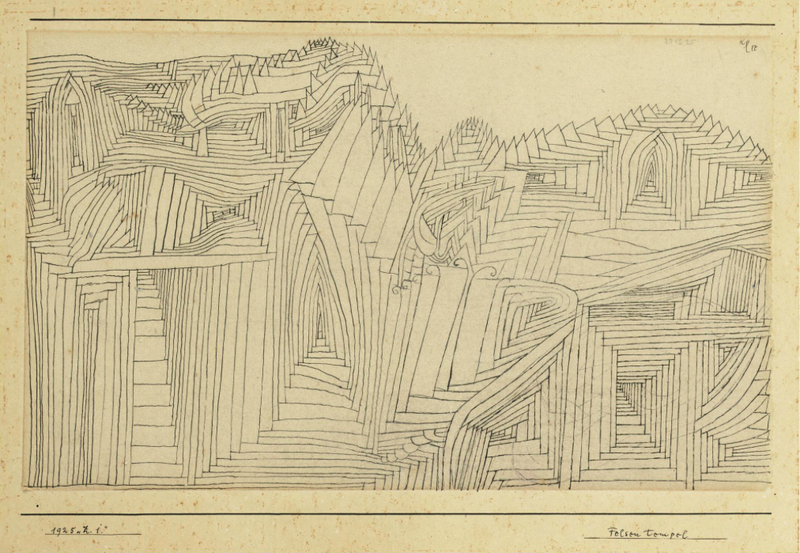 In addition, Klee produced an entire series of line drawings similar in style to this one. Now, if the Mt. 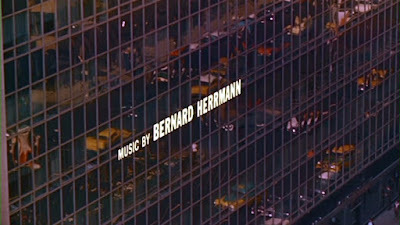 Rushmore scene was inspired, at least in part, by Klee drawings, then it raises further questions about the influences behind the previous scenes—as well as the movie's entire graphic scheme, noted above. 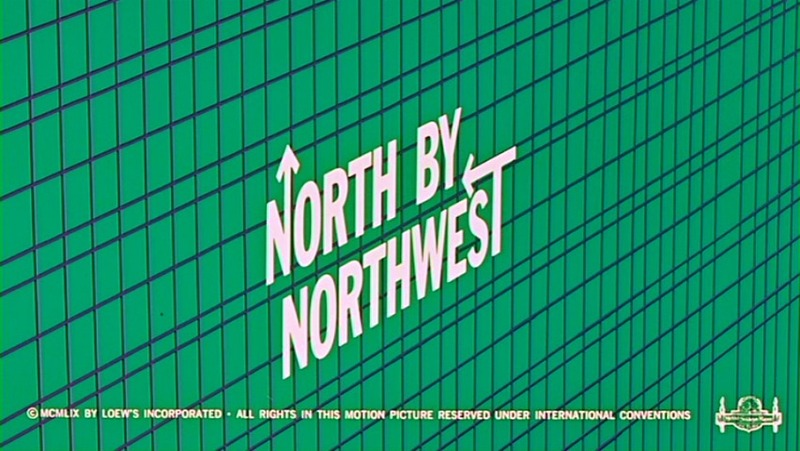 North by Northwest explores the clash between tradition and modernism. Van Damme, (James Mason), preceded by ten feet by his plummy British accent, masquerades as old American money, hiding out first in a venerable Long Island mansion whose name—Townsend—hints at simpler, bygone times. He attends antique art auctions and hides his MacGuffins in pre-Columbian statuary. Even the type of aircraft—a biplane—that attacks Thornhill wouldn't have seen battle since World War I. Meanwhile, Thornhill wears tailored, stylish suits, works as an ad man in a sleek glass Manhattan skyscraper and, as befits the modern man, supports "two ex-wives and several bartenders." 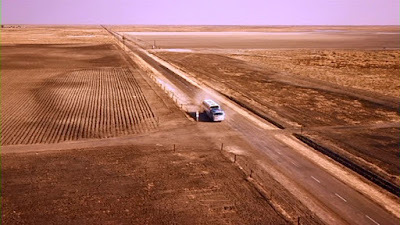 However, modernity gets the last word in in North by Northwest. When Van Damm moves his entourage into that Frank Lloyd Wright-inspired house behind Mt. Rushmore (finished in 1941), his time literally runs out. During the final chase, his beloved (and hollow) pre-Columbian statue is smashed against one of America's greatest symbols of progress and triumphant patriotism. Nice touch, Hitch. It's also a neat, ironic coda: our forefathers, symbolized by the faces on Rushmore, also smashed those tribes that had occupied this land since pre-Columbian times—a theme that Hitch had visited the year before in Vertigo. That ironic ambivalence, of course, is at the heart of this movie that declares that "War is hell, Mr. Thornhill. Even when it's a cold one," and that has America's favorite leading man, Cary Grant, respond in disgust, "Perhaps you ought to start learning how to lose a few cold wars." After all, the point of so much modern art wasn't just to say something new, but, rather, to highlight the hollowness of modernism itself, especially the lethal hypocrisy of modern statecraft. From his youth as a member of the London Film Society onward, Hitch internalized these views and they crop up over and over in his movies. All that time, Klee's aesthetic approach was apparently never far from his mind. Charlotte Chandler even went so far as to say that "Hitchcock’s own drawings bore a certain resemblance to those of Klee." If you're looking for Klee's influence on Hitch's films, it's everywhere—and yet, as befits a master of his craft, it's also nowhere. In my next post, we'll be talking about how Klee and Hitch nourished their creativity from the same pot. Come back! Side note: I've written extensively about such connections on this blog, but I need to tell you where my own inspiration comes from. In 1999, I visited the Hitchcock centennial exhibition at the Montreal Museum of Fine Arts, Hitchcock and Art: Fatal Coincidences. This show laid it all out with film stills, dozens of props, and even full recreations of many iconic film sets—all placed alongside original artworks that, the curators suggested, had been the inspiration for these scenes—or, at least, fascinating coincidences. 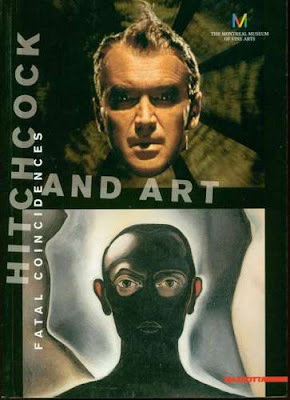 Taken as a whole, the exhibition placed Hitchcock firmly within the pantheon of great 20th century artists. This event changed my life and my outlook on film in general, Hitch in particular. There are still copies of the copiously-illustrated 500-page souvenir book around. Next to Hitchcock/Truffaut, it's one of the most important books on Hitchcock out there.